Maestro George Schick, Music Consultant of the Metropolitan Opera at the time, had taken a big interest in me, along with the Met, since my having won the attention of several major New York critics, the likes of Irving Kolodin, Winthrop Sargeant and Harold Schonberg, all of whom had written very favorably about me, after my involvement in the Met Auditions, while I was still at Oberlin College. Shortly thereafter, Mo. Schick called me at Oberlin, saying that Mo. Erich Leinsdorf was looking for a leading soprano to head a stellar team for the opening of the Boston Symphony season, in Beethoven’s Ninth Symphony and Missa Solemnis, and that he, Mo. Schick, and the Metropolitan Opera, would like to bring me to Mo. Leinsdorf’s attention, as well as a few other conductors. Was I willing to come back to New York and sing for Mo. Leinsdorf at the arrangement of the Met? I, in the middle of classes and finals, of course immediately mentioned this to my voice teacher at Oberlin, Ellen Repp, who simply said, “You go! I’ll take care of the school”. So off I went to New York, excited by this hugely complimentary prospect. 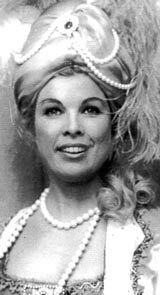 Later, at rehearsals in Boston, Leinsdorf took me aside, and said, "You may think I was unreasonably severe with you when you sang for me." I said nothing. He then looked at me square in the eye and said, "Yes, I may have been severe and unreasonable with you, but you delivered and stood up to me, didn't you! The test of ones worth often comes with barbs and hurdles and passing these tests is not a small matter. Remember this." He smiled at me very earnestly.